The Quad Cities River Bandits extended their winning streak to five games with a 6-1 win at Wisconsin's Fox Cities Stadium on Saturday evening. 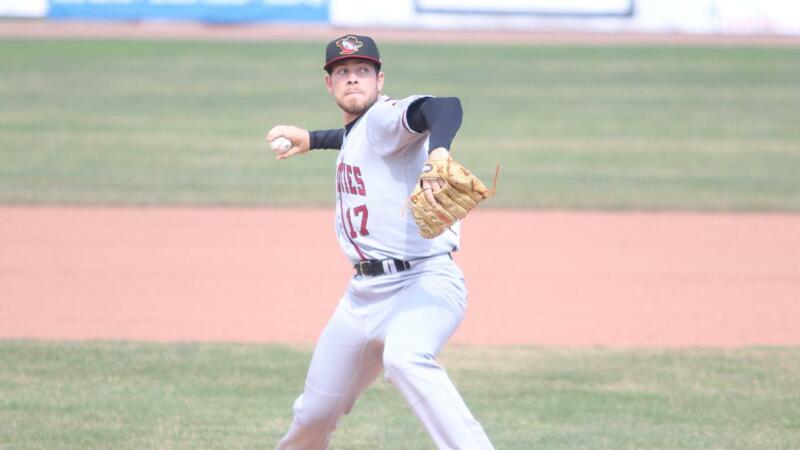 The River Bandits overcame frigid conditions to tally 11 hits. Brett Conine and Matt Ruppenthal combined to strike out 12 Wisconsin hitters and limit the Timber Rattlers to just three hits. The Bandits have won five consecutive games. The River Bandits (6-3) opened the scoring with an unearned run in the top of the first inning. Jeremy Pena worked a walk with two outs and quickly stole second. The next batter, Scott Schreiber, hit a bouncer to short, but the first baseman dropped the ball on the throw and Pena raced home for a 1-0 lead. The Bandits first two runs on Friday night were also unearned. The Bandits did not score in the second, but put a crooked number on the board in the third to widen the gap. Austin Dennis opened the inning by splitting the gap in right center for a triple. It was his first hit in a Bandits uniform. Dennis scored on Trey Dawson's infield single to the left of the mound. Enmanuel Valdez put two runners in scoring position with no outs by doubling into the gap. Jeremy Pena took advantage with a groundball into center field that plated two more runs and made it 4-0. Wisconsin (4-5) trimmed a run off the lead with a solo home run from Gabriel Garcia in the bottom of the fourth. However, Quad Cities answered right back in the top of the next inning. Valdez lined his second double of the night to put himself into scoring position. He moved up 90 feet on a wild pitch and then scored on a second wild pitch to establish a 5-1 advantage. The Bandits added another run to the lead in the top of the seventh to go up 6-1. Scott Schreiber slapped a single through the right side to open the frame and went to second on an errant pickoff attempt by Max Lazar. Jonathan Lacroix drove him in with a line drive double into left field for his third RBI of the campaign. Three River Bandits finished with multiple hits on the night. Valdez went 2-4 with a pair of doubles and two runs scored. Both Pena and Schreiber also collected two hits to stretch their hit streaks to six consecutive games. Lacroix has hit safely in seven of the eight games he has played in this season. Conine picked up his first win by allowing just one run on three hits over 6.0 innings. Ruppenthal allowed just one baserunner over the final 3.0 frames as he struck out six to earn the save. The series will conclude in Appleton on Sunday afternoon at 1:05 p.m. RHP Mark Moclair (0-0, 5.40) will be the starting pitcher for the River Bandits in a meeting with Wisconsin RHP Justin Bullock (0-0, 12.27). All River Bandits games are broadcast on 1170 K-BOB and TuneIn Radio. Home games are also available with video on MiLB.